Great Britain's men came through a dramatic high-bar finale to win their first European Gymnastics team gold medal in Montpellier on Saturday. Britain's unprecedented title came as a strong Russian squad, hosts France and Germany all made costly errors. 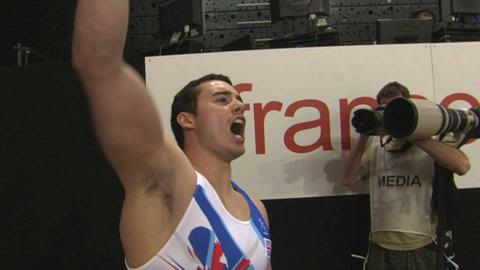 Kristian Thomas, by contrast, held his nerve for a superb last routine on the high bar to win the gold for Britain. Max Whitlock -"I did feel pretty bad after my routine, I put more pressure on Kristian Thomas." Louis Smith (interrupting) - "A bit more pressure?" Max Whitlock - "Probably a lot more pressure - but he dealt with it really well." "It was an amazing experience. I knew I had to hit a clean routine to win the gold," Thomas told BBC Sport. "I knew I was capable, it was just dealing with the pressure and the nerves. Now it's over, it's pretty enjoyable." The previous best finish for GB's men had been second place in Birmingham two years ago. This year's five-man team had already set two records by earlier in the week while every GB gymnast reached a major final - both firsts for a British squad, male or female. Having qualified in first place, defending that in the final promised to be a challenging task. Russia had a shaky qualifying on Thursday but looked to have recovered for much of Saturday's final as they initially edged Britain for top spot. Eventually, a fall for Russia's Anton Golotsutskov on the high bar let Britain slip into a lead, which they held thanks to Thomas in a nerve-wracking finale after team-mate Max Whitlock had fallen from the same apparatus. Thomas, needing to score more than 14.372 to secure the gold, barely faltered on high bar in the very last routine of the competition. His score of 15.133 was met with jubilation among the British coaches and gymnasts. Olympic bronze medallist Louis Smith had earlier earned a mark of 15.833 on the pommel horse, the day's highest score by far in that event - though marginally down on the 15.900 he produced in qualifying. Ruslan Panteleymonov's impressive vault for 16.100 then moved Britain above Russia at a crucial point in the competition, just as Golotsutskov fell. "We're using this as preparation for the Olympic Games and rewriting the record books with that result," said Smith. "It can do nothing but positive mental things in terms of getting ready for the Olympics. "Max gave us a bit of a scare but he did fantastically on the other pieces, and Kristian was as solid as a rock." France had a disastrous outing including three non-scoring routines to finish last by a distance, while Germany also struggled across the board. Britain finished with a score of 266.296 from their 18 routines, 0.761 points ahead of Russia's 265.535 with Romania scoring 261.319 for third, some way behind. Thomas has two further medal opportunities for Britain in Sunday's individual finals, in the floor and vault, with Panteleymonov joining him on the vault and Dan Purvis also in the floor final. Smith and Whitlock are both in the pommel horse final, where Smith is expected to battle Hungary's Krisztian Berki (who also posted 15.900 in qualifying) for gold. This is the last major international tournament remaining for Britain's gymnasts prior to the Olympic Games. The GB team for London 2012 will be announced in early July following the conclusion of the British Championships in Liverpool, which act as a final Olympic trial for both men and women.